It is rather unfair to call Eduard Kuznetsov, his then wife Sylvia Zalmanson, and their fourteen fellow Refuseniks hijackers. They would have been perfectly willing to buy tickets to the West, if the Soviets had granted them exit visas. Nor were they holding guns on frightened flight attendants. They just intended to “borrow” a small 12-seat, wing-and-a-prayer Antonov An-2 commuter plane. The escape attempt did not go according to plan, but neither did the resulting show trial. 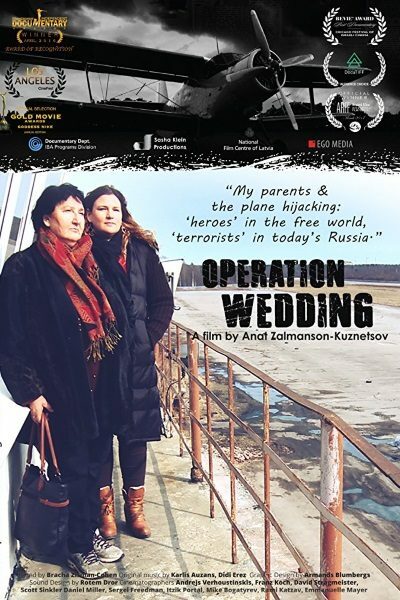 Anat Zalmanson-Kuznetsov documents her parents’ remarkable true story in Operation Wedding (trailer here), which screens during the 2018 Kew Gardens Festival of Cinema. The idea was relatively simple, but not simple enough. Posing as a wedding party, Kuznetsov and company bought all the tickets on a puddle-jumping flight originating in “Leningrad.” They would just tie up the flight crew—leaving them tucked into sleeping bags so they wouldn’t get cold, mind you—and then just fly themselves to the West. Unfortunately, the KGB was onto them from the start, so they never even set foot on the plane. Of course, the mighty Socialist system had to make an example of the Refuseniks the state media quickly dubbed “terrorists,” so they convened a show trial that would duly sentence Kuznetsov and their pilot Mark Dymshits to death, which it most certainly did. However, the accused did not act like the broken old revolutionaries of the original Moscow Show Trials. They stuck to their guns, denouncing the injustice of the Soviet system, particularly its restrictive immigration laws (just for the record, these applied to people trying to get out, which is a much different proposition than trying to control who comes in). Zalmanson was particularly eloquent, so she became an international symbol of Soviet oppression. Obviously, Kuznetsov’s scheduled execution was not carried out, since he discusses the dramatic chain of events in great depth with his documentarian daughter. It is a pretty incredible chronicle, in which perhaps history’s greatest odd couple, Golda Meir and Generalissimo Francisco Franco (who was not dead yet) worked in tandem to embarrass the Soviets. Zalmanson was such a bipartisan cause célèbre throughout the West, it is frankly a bit scary how quickly and completely she has receded from the pubic consciousness. That is why Operation Wedding is such a necessary film right now. In fact, Russian filmmakers are still trying to rewrite the history of this incident through the lens of Soviet revisionism. Fortunately, Zalmanson-Kuznetsov has plenty of documentation to back up the accounts of her parents. She also has KGB defector Oleg Kalugin on-camera, happily confirming all the dirty conducted by his former agency. It definitely sets the record straight, but there are also moments of real drama, as when Zalmanson revisits the KGB prison where she spent years as a prisoner of conscience, including several months in solitary confinement—all in a quite economical sixty-two minutes. As a filmmaker, Zalmanson-Kuznetsov’s approach is understandably straight forward, but she shows a bit of style nonetheless, including some subtly clever transitions. History really does repeat itself. If the Dymshits-Kuznetsov escape attempt sounds familiar, it is because a group of Georgia dissidents tried something similar in 1983, but it was more like a conventional hijacking, which gave Eduard Schevardnadze and his Kremlin masters license to crush them mercilessly (as dramatized in the recent film Hostages). Clearly, the experience of Refuseniks like Zalmanson and Kuznetsov has timely implications for the neo-Soviet era of Putin. It is also a reminder of how different our politics looked in the early 1970s. Yet, it is also just amazing story. Very highly recommended, Operation Wedding screens this Wednesday (8/8), as part of Queens Museum Block 5, during the Kew Gardens Festival of Cinema.